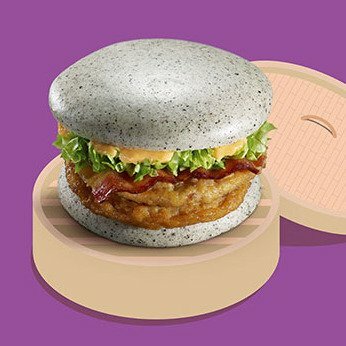 McDonald’s has launched Modern Chinese Burger featuring pork patties in a steamed silver bun. The limited edition sandwich appears on McDonald’s China menu last week. Modern Chinese Burger’s fillings are pork patty, bacon and salad topped with Thousand Island/Sichuan-inspired dressing. The meat and condiments are wedged between an unlikely choice of bread – a slightly metallic gray bun. Reviewers at Time Out Beijing were initially grossed out by the burger’s appearance, but they reportedly sampled it and enjoyed its taste. The Modern Chinese Burger will be available at select locations in China until November 3.